Good thing we brought our umbrellas! 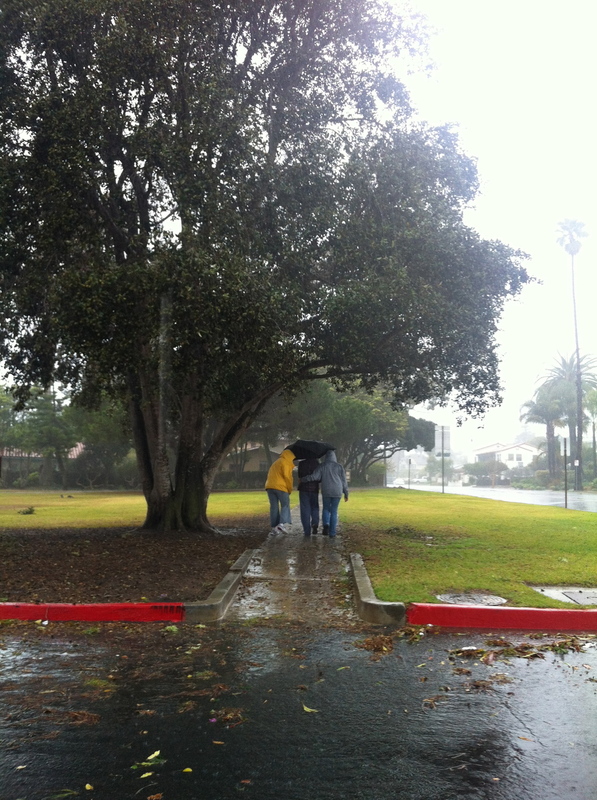 There is something special about a rainy day in Southern California. It's a magical time when I'm finally able to sit around and snuggle up with my Netflix account without feeling guilty that I'm wasting a perfect day. This was going to be one of those weekends, I thought. It had rained for most of the day on Friday, so I felt that I would be too lazy to leave the house at all. Micah arrived on Friday night, and we had planned to get lunch and maybe boba, if it didn't continue to rain. We woke up Saturday morning and it was raining and we started off the day with some breakfast. We started watching Justice League and I didn't think we'd stop all day until my mom asked us if we wanted to go for a walk. She said something about how the ocean looked cool and she wanted to take a quick walk while it had stopped raining. So, I broke out the rain boots that had been collecting dust in the corner of my room and went for a walk in the rain with my mom, my auntie and cousin, and my boyfriend. My cousin Annie, my mom, and my Auntie as we set out on our walk in the park. Grey, foamy water seemed high as we walked around the cliff side. We made sure to take plenty of pictures to document our adventure. We weren't the only ones that were braving the storm - we met a few dog-owners and joggers on the way. However, I felt weird because we weren't trying to tire out our dogs or get in our exercise for the day - we just wanted to look at the ocean. It was supposed to be a short walk and we almost didn't bring the umbrellas - but it's good that we did. It started raining 10 minutes into our walk. We made it home with soaked jeans and wet shoes. My mom made hot chocolate and Micah and I watched Justice League while Annie played games on her phone. We went out a couple more times for food, including the best boba in Santa Barbara. Then spent most of the time inside. There isn't much you can do on a rainy day in Southern California. Or that's what Southern Californians might think anyways - the rain seems to halt everything, even one's motivation to work. However, just taking a simple walk and appreciating the rain and transformed scenery was a new experience in itself - something that I won't forget anytime soon.